Time and Attendance - Courtesy of Secured Payroll Partners (SPP), Inc.
* Our SecuredClock Solution is available for a FREE 30-day trial period! Offer does not apply to our other solutions. 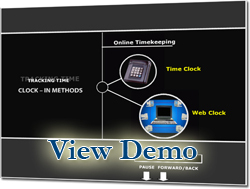 SecuredClock is an online electronic time and attendance solution for all businesses, large and small. It combines the convenience of online access with the familiarity of a conventional wall-mounted time clock and PC for time data collection. Secured Payroll Partners (SPP) offers a service which is entirely online, so there's no software to buy, install, or upgrade. The SecuredClock solution defines practicality in today's timekeeping industry. Our TimeClock™ is easy to set up - just plug it in and begin punching. It's also easy to use - simply punch in and out with the push of a button, swipe of a card, through a finger verification scan, or online through your PC. Ask us about the timeclock options available! The SecuredClock solution was designed with "everyday people" in mind. There is NO software to install, and you can simply view, edit, and run reports right through your Web browser. Our web-based server automatically does all the collecting, calculating, processing, and reporting quickly and accurately. The theory of saving money doing payroll yourself, once you add your time in to it, there is no savings. If we have an issue or question or concern, I can call either Greg or Amanda, and have a response from them very promptly. You don’t sit on hold to talk to a total stranger everytime you call in. Their systems are very easy to use and monitor throughout the week. Staying competitive in business today requires companies to find new, controllable ways to drive revenues and profitability. On that note, many companies today do not realize that they can significantly reduce the cost of one of their greatest expenses, employee labor, thus increasing company profitability. View set-up instructions, "how-to" pages, importing employees, and access user training.